Behind My Red Door: It Ain't Over Yet Baby!! Die Hard Red Sox fans knew what I meant right away didn't ya? I am one sleepy Keeper of the Home today because I stayed up to watch the Sox make history and come back from a 7-ZIP game and win last night to keep them alive in the playoffs. Hey, they did away with the so-called Babe Ruth curse already so we KNEW it was possible! It was about this time last year that DH and drove out to OH to see some friends. The Sox were loosing the division series to he Cleveland Indians by seemingly impossible odds. I was at a church with Wyatt and Jake, the adorable, I mean handsome, then 7 year old twins I was visiting (along with their wonderful parents) and the boys got to introduce their guest (me) and say where I was from (MA). The gentleman running the program had the nerve to say THIS to me. "Your baseball team has my deepest sympathy." And like any good die hard Red Sox fan (who was never going to see him again so she didn't need to worry about being embarrassed later) said "It AIN'T over yet!" And well, it was my duty to (and sweet revenge) to send him a message not too many days later saying "YOUR baseball team has MY sympathy". Hehehehe yes, it was sweet! It ain't over yet baby!! Is anyone else happy it is Friday? I know, I know it was a short work week, but for some reason to me it seemed longer than normal- maybe it's the lack of sleep because of these late night games. I just love Friday's because it means DH is home for 2 days. When he left his job of over 32 years almost 2 years ago to take this job, we never dreamed he would be working such long days again. But that is part of the unknown and the risk you take with a start up company. When they made him an offer we couldn't refuse, it was because of a substantial increase in salary that would help us to achieve our dream of his early retirement - that was plan anyway and we still HOPE it will happen. We have always lived well under our means that is why we were a good ways towards that dream already, but now with the stock market doing so poorly, we have decided to do what everyone else is doing and see where we can save even more. We are doing our best to keep that dream alive. I am really good at stretching our food dollars but I am doubling that effort. I am making a pledge to use the crafting supplies I have on hand already to work on my new projects as best I can. I am planning my errands better and driving less and staying home more. We don't eat out very often to begin with just because I don't mind cooking, but we will think twice about doing that now. I am shutting off electronics more often, using fewer lights, and come winter, I'll heat my office with a little space heater instead of cranking up the heat in the whole house on days I am home alone. I know several families are getting those outside wood burners to heat their homes. That is not an option for us because wood smoke can be horrible for lungs and mine in particular don't like it at all. Even though I think it smells wonderful, it is one of the worst triggers for asthma in many people so I'll be resourceful in other ways. My prim shopping will be cut back of course. We aren't the type to run to Starbucks for a cup of Joe, in fact I have NEVER had a Starbucks coffee. It goes against my grain to spend money like that when it just takes minutes to start the Mr. Coffee but I will watch for sales on coffee and stock up. Those are just a few ways I plan on cutting back. How about everyone else? What are you doing in light of the down turn in the economy? Maybe we could all share those money saving ideas - who knows, you may have an idea I neverthough of! While I was catching up with blogs, I discovered that my new blogging friend Jamie, over the Miller Homestead also honored me with the Fabulous Fall Decor award. Thanks Jamie, I really appreciate that you think my blog is worthy of such an honor. Please stop by her blog to say hello, and click on the link to her home albums on Webshots too. She is a very sweet gal! Speaking of fall decor, I have a few pictures of my limited Halloween decor. I used to do it up big for the kids, but now, I limit it to a few prim Halloween decorations. I still have a box of other fun stuff, but it is waiting in the attic for the time that future grand kids come to visit. Here is my Halloween tree. I apologize that I don't have closer views of the boots, witch's hats, crows, bats, candy corn, white and orange pumpkins, ghost, black cats and moons. I love this nubby little stenciled towel. This gourd lives here all year but I hide his face the rest of the year. Shame on me! I love this hooked wool jack. He is unhappy because he has the hottest spot in the house. A school family gave me this mini jack many years ago so he is special. This Jill o'lantern doll is reversible. The rest of the season she is just a plain old pumpkin head - poor girl. This friendly prim witch has one black eye but she's not telling me what happened. I didn't ask either. I figure what happens in OZ, stays in OZ. I raised teens - I know what TMI means. So that's it for my prim Halloween decor! Thanks for taking a peak! And speaking of stretching the food dollar, here is one of my DH's favorite ways for me to use leftover pork. First I should say he hates leftovers for the most part so I have to be creative. And then I should explain my favorite way to cook pork in the fall. I always look for pork tenderloins on sale and keep them in the freezer. They cook up nicely and are lean too. 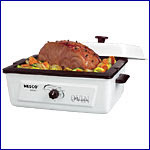 I use either my 4 qt or 6 qt Nesco Roasting Ovens. I guess I need to explain about my those too. 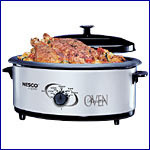 Nesco Roasting Ovens have removable cooking wells and can be set to any temp, like your regular oven, not just low, medium and high like crock pots. Another way they differ from crock pots in that there is a heating element around the sides, not the bottom. It heats more evenly. and a huge 18 quart roasting oven - it looks like a much bigger version of the 4 qt. I use them several times a week in the colder months for soup, stews, roasts, one dish meals, making my pasta sauce and more. I cook the Thanksgiving turkey in the largest one and it stays so moist and does not dry out at all and it frees up the oven too. I used that roaster to make 18 qts of chili or pasta for the football team when Jay was in high school. It's great to put on the deck in the summer and steam corn on the cob for a crowd while you are grilling. We have used it to steam hot dogs for over 50 people too. Any size is a great way to cook all year and not heat up the kitchen. It's a less expensive alternative to turning on the big oven when you don't need to. And the food is always moist. I truly don't know what I would do without them! I got all of mine from QVC many YEARS ago so I do not know if they still carry them. I should note this - you won't get the browning on roasts and the skin on poultry like you do in a traditional oven, but the meat will be much more tender! If you want chicken that falls off the bone, this is the way to cook it. So to cook the pork tenderloin, or even a pork loin roast, I slice a large onion into rings, peel and slice 2-3 apples into rings and lay them both in the bottom of the Nesco. I sprinkle them with some cracked black pepper and garlic powder. I lay the roast on top. I then take one package of dry pork gravy mix(Like McCormick brand) and sprinkle it over everything. Put the cover on and cook on low heat for several hours. It comes out moist and tender with the most delicious gravy. To make DH's Pork Chop Suey, I saute some sliced celery and onion in my deep fry pan. I just use Pam. When they are tender crisp, I add one can of drained sliced water chestnuts, one can drained bamboo shoots, one can drained of bean sprouts and about a cup of water, 1 Tablespoon of molasses(trust me), several teaspoons of light soy sauce, and a little more garlic. I let them simmer about 10-15 minutes and then I add the leftover pork which I have diced small and any remaining gravy. If you don't have a lot of gravy left you can add another package of the pork gravy mix. Simmer a little longer and then I thicken it with cornstarch just before I serve it over white rice. Top it with the crispy Chinese noodles and viola! LOL Like manybrown foods, it tastes better than it looks - I promise! My MIL made this when DH was growing up so it is comfort food to him. I have used left over beef as well so you can try that if you prefer. And speaking of DH ( wow, I did that 'speaking of' thing 3 times in this post!) I did some tweaking in his office at home. It is the smallest room in the house but we still mange to fit in his big desk, a book case, a TV cabinet and TV, a narrow jelly cupboard, and a full size sofa. Oh and a small prim table I use as his printer stand. Here are a few pictures of his room so far. His desk corner. He made the desk back in the late 70's. I know it's not prim but it means a lot to him so it is staying. The large photo over the desk is him and a fellow worker in 1976 working inside a coal boiler. We think it's 1976 anyway - he has his wedding ring on, so we know it is later than 1975, and his long sideburns help date it as well! Despite having a college degree, he started out the hard way and worked his way up the ladder, going back to college at night and taking professional courses as well. This photo hung on the wall of history in his previous company and when he left, they let me have it and surprise him with it. It tells a piece of the history of that company and my DH was a part of that for over 32 years. He's the cute guy on the left. This simple book case means a lot to me. It was once in the preschool our kids went to and where I later taught and was the Director. It was lime green back then. When DH took this job, he worked at home a lot in the beginning and still does at times, so we had to make his den into a real working office for him so parts of it are not so prim. But that's OK. It's his space. This is the area that got some tweaking. The painting to the left of the window is a still life of an old tin bucket and apple that my mom painted many years ago. Here's a better view of her painting. I love it! I need a bigger lamp for this corner. It is not balanced. In an effort to save, I am looking for the kit to make one of my jugs into a lamp like I have done many times before. You can see a bit of the old sofa he uses when he watches TV in here. I was so excited in the very late 80's when I got that slate blue sofa with a cream and barn red design. I thought I had arrived! LOL It was in the living room but because we used the family room for daily hanging around, it stayed in fairly good condition, though is a bit faded. We had to take the moldings off the door to get it in here so I suspect it is staying for awhile. I camouflage it with my colonial flame stitch throw. Well that's it for this post. Have a great weekend and enjoy the fall goodness all around! I'll be doing just that and DH and I will watch the Red Sox win the playoff series once again as they head towards yet another Word series win. Yup, it ain't over yet baby! !